Can I just tell you guys how much of a fan-girl I am of the Pioneer Woman (Ree Drummond)? Ok so don’t laugh but…I would put on her show while on the elliptical at the Y so that I’d stay on for the whole time I was supposed to. That is…before the Y switched to the cheap affordable cable and we didn’t get the Food Network anymore. One of my FAVORITE recipes she’s ever done is her famous Chicken Spaghetti. OMG it is an institution! And I’ve made it for my family plenty of times and they love it. I’ve made it for work potlucks and they love it. You know the only place where there is no love for that casserole? In my pouch! Because my pouch hates noodles. Yes all noodles. And no need to suggest your favorite noodle, I’ve tried enough of them to accept that noodles just don’t work for me. But zoodles? Ah…they work like a charm! Now don’t ask me why I didn’t do this recipe for the book. I honestly can’t tell you. But I am making that right…right here, right now! By the way, how cute is this dish on the new Livliga bariatric set??? The original recipe is pretty simple, but I did deviate a bit. So after you have cut your zoodles, sprinkled them with salt, and let them drain of some of the excess water (I recommend a few hours in the fridge for this) you’re gonna either cook up some chicken (I used chicken breast tenderloins that I diced) or this recipe is great for leftover rotisserie chicken. 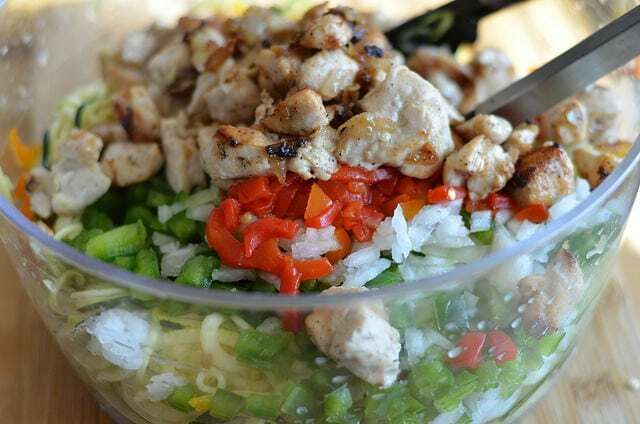 I added my zoodles to a big bowl with diced green, orange and yellow peppers, chopped onions and sliced pimentos. I also made a few other modifications to the original recipe. I use ground chipotle pepper instead of cayenne pepper and a bit of smoked paprika. Since the zoodles had already been salted, I didn’t add any additional salt. And since they are…well…zoodles…I omitted the milk in the recipe because the zoodles added enough liquid to do what it needed to do. Then I transferred it all to a 9 x 13 casserole dish and popped it into a 350 degree pre-heated oven. It released so much liquid, even though I used ALL my zoodle liquid removal tricks! 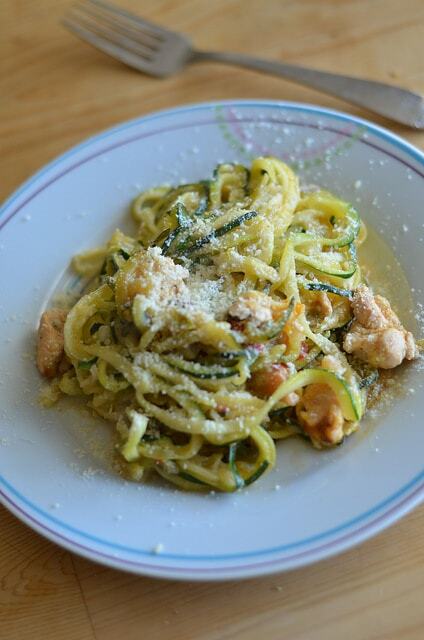 The struggle with zoodles is so real! I salted and drained them a whole 24 hours before cooking and spun them in a salad spinner and they still released a bunch of water in the finished product. 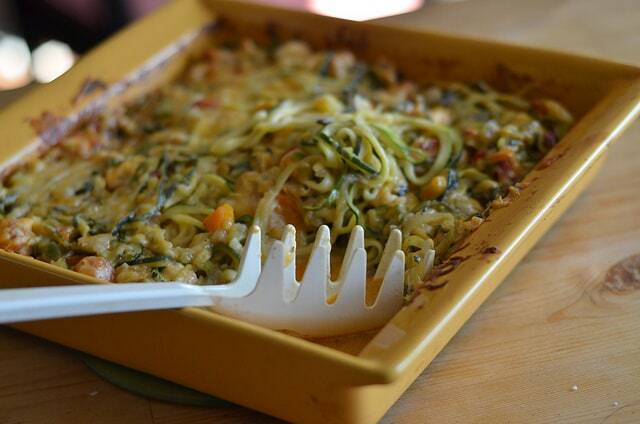 This, of course, is owing to the fact that zucchini are 90-some percent water! So they always have more water to give, Foodies. Remember that. At any rate, I ended up draining some of the water off the casserole mid-way in and let the oven take care of some of the rest by leaving it uncovered the entire time I cooked. In retrospect I might have used two cans of cream soup to offset the water. Maybe I will next time! So far as flavor, it was legit! Now since I made changes, it may not taste exactly like Ree’s Chicken Spaghetti but the flavor is true to the recipe I have been making all this time – so woot! 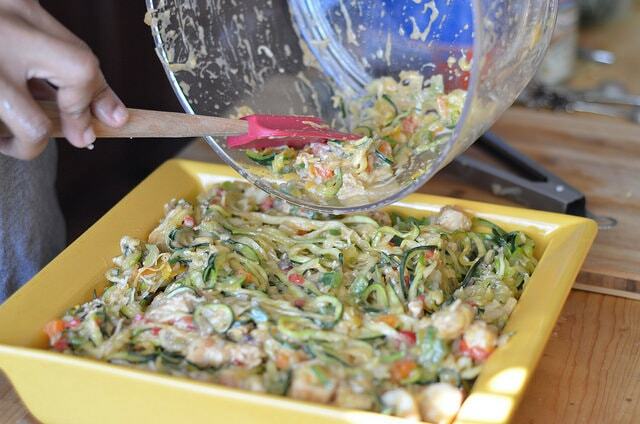 A few hours before you intend to cook the meal, spiralize your zucchini into zoodles, salt them generously and place them in an airtight container in the refrigerator. When ready to cook, put them through a salad spinner and spin 4 or 5 times to remove excess salt and water. If you haven't already cooked your chicken, be sure to cook it thoroughly, using whatever method you like best. The result should be one pound of cooked chicken pieces (or shredded chicken, if using a rotisserie chicken). 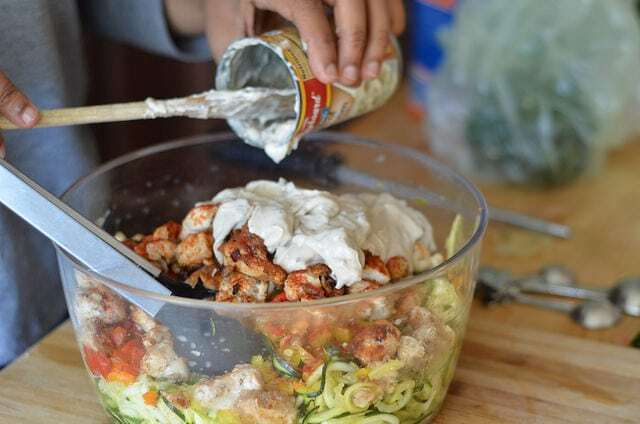 To a large bowl, add zoodles, diced vegetables, chicken, and spices. Toss with tongs until fully mixed. 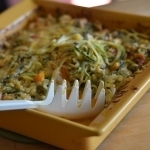 Add cream of mushroom soup and use tongs to incorporate it into the entire bowl of zoodles, meat and cheese. 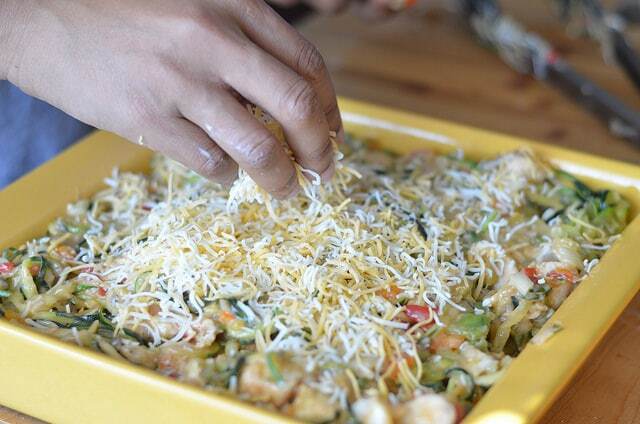 Add the mixture to a 9 x 13 casserole dish and top with shredded cheese. Bake about 45 minutes or until cheese on top is done to your liking. As I said, zoodles hold a LOT of water. You might consider using extra soup to make up the difference, but then your dish will be quite saucy. This, in my estimation, is not necessarily a bad thing. Halfway through cooking, I actually drained much of the water by tipping the casserole dish over a bowl and pulling the casserole back with a heat-resistant rubber spatula. I love zoodles too! I find whenever I bake them it turns out better if I use sweet potato and leave the zucchini or squash for quick saute or raw. If zucchini still is the best, would it work to make the sauce and put in oven sans zoodles then add them in to a bowl, spoon sauce over and let the sauce heat the zoodles then? Hi there! I think you are right. Zucchini are always just challenging for baked stuff. Someone suggested pre-baking the noodles before combining with other stuff and baking again. I may try that (works for lasagna!). Spooning over technically would work but the beauty of the original dish is that the noodles are infused with the flavor of the sauce. That happens in this dish too. I’m gonna keep working on it. Stay tuned! She even blogged about a gift that Keli made for her – some stuffed owl pillows she freehand made for her. I love her cooking too. Although sadly most of it is the same kind of cooking I grew up with. It’s good but doesn’t help with keeping the pounds away. Thanks for re-doing a recipe! I think it could! In fact it might be easier because squash doesn’t contain the same water content as zucchini, so it could be easier to work with. If I had to guess I’d say to make the same amount you’d use about 2-3 good sized squash. Or, you could reduce the recipe! Let me know how it goes. What is the protein and nutrition data?!! I don’t provide nutrition information from my recipes on this website. But with the information I have given you should be able to plug it into your own food journal and get the data no problem! 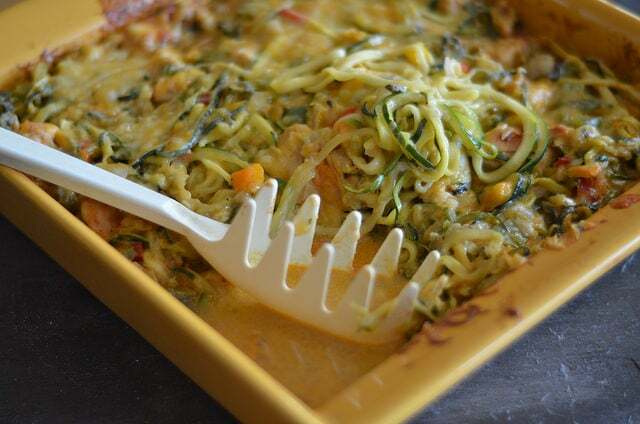 You could always bake all of the ingredients but the zoodles, then spoon them over sauteed zoodles when ready to serve.